The charge happens when you turn ON the Shared Access… I believe that as long as you have not shut OFF the shared access, then generating or refreshing a link will not cost extra energy. 1000 energy is taken once when you first generate sharing QR code. Confirmed. I used “Generate Link” to get the QR code and didn’t loose any energy. I was hesitant to just try it for fear of it taking more energy, making me have to figure out how to get it back. Thanks for the replies. If the system is smart enough to know not to take more energy, then couldn’t it replace the “🗲 1000” under “Generate Link” with “Already paid”, or something similar? At least the documentation should be updated, or a FAQ created, to point out this case. you only have to pay once (for a given project) regardless of whether sharing is repeatedly turned on and off. 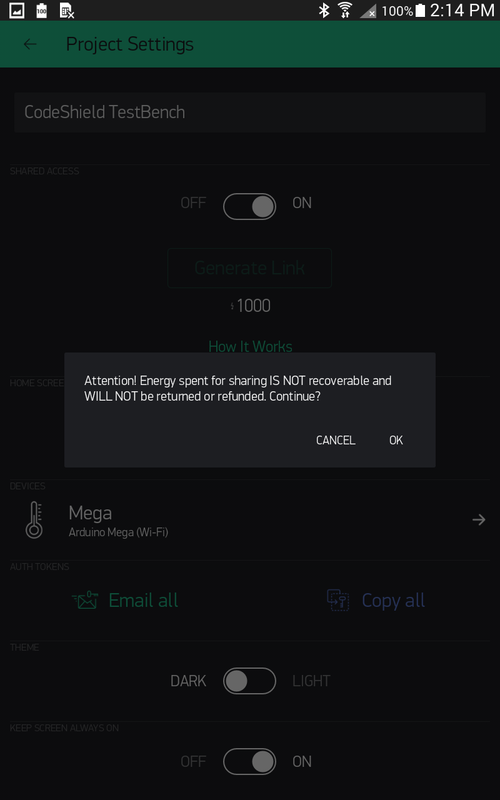 I would hope that you also get a similar warning/confirmation popup when you attempt turn it off, indicating that in turning off sharing you will be charged again if you decide to turn it back on. And it’s too bad; it would be nice to be able to temporarily turn off sharing without expense, to allow enhancing or modifying a project, without interference from shared users while experimenting and testing the changes. Unless those users are constantly poking on the screen, they are unlikely to interfere with much as they can only see the project when it is active and running anyhow. And you can always simply refresh the QR (which will deactivate any old ones) and send them the new QR when you are ready. The ability to disable/enable sharing without penalty would still be easier, especially if there are hundreds of users that you would have to distribute a new QR to. Besides, is there any disadvantage to being able to disable/enable once you’ve paid for the feature? especially if there are hundreds of users that you would have to distribute a new QR to. Yes, one possibility is to help keep people from overloading the otherwise free cloud servers from overhead due to the constant flow of multi-shared users who are not contributing (via normal widget energy purchase) to Blynks server maintenance expenses. How would being able to disable and enable sharing affect server overloading? In fact any time sharing was disabled it would potentially reduce server load. The project owner may wish to enable sharing only during certain times. Again… based on what developers have already indicated… sharing is a simple method for demoing your projects, not a way of utilising larger comercial like sharing. Thus IMO adding lots of features that would simplify multi sharing would only cause more commercial type use… thus server load. Can you point me to somewhere where the developers have stated that sharing is primarily meant for demonstration purposes, as opposed to allowing non-modify user rights to a project, or is this just your own personal opinion? Personally, I use sharing to allow members of my family to use the project with my specific hardware, without the possibility for any of them to inadvertently mess it up and possibly render it inoperable. For me, it’s not just for demonstrating what I’ve created. And if it is just for your family, then your argument for sending a new QR to “hundreds of users” is a moot point… just use it the way it is designed, refresh the QR and grant new one as needed. Just screen shot and save the qr image. You can scan how many times you want. No. Charging happens when you generate a sharing QR for the first time for the project. The popup @Gunner showed saying you’ll be charged on Android seems to be a bug. it would be nice to be able to temporarily turn off sharing without expense, to allow enhancing or modifying a project, without interference from shared users while experimenting and testing the changes. No need to turn sharing off. When you stop the project to make changes, it is automatically paused for shared use. then couldn’t it replace the “🗲 1000” under “Generate Link” with “Already paid”, or something similar? The popup @Gunner showed saying you’ll be charged on Android seems to be a bug. Yes, it seems to be popping up in the wrong place/time. Sharing will be soon changed from various perspectives: UX, business model, features. So there will be no changes implemented in nearest future to fix minor bugs. There is nothing critical. @Gunner was right, Sharing was made as a feature prototype, but then found it’s way to more extensive and creative use by Blynkers. But the idea was to be able to start the project with sharing disabled, so the owner can test the changes for proper operation, without the possibility that shared users will interfere with that testing by fiddling with it at the same time. 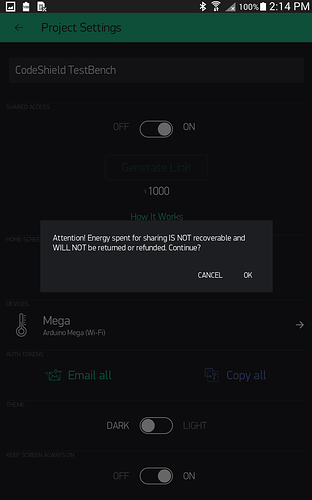 Anyway, it appears by what has been stated that you can turn sharing off without losing energy, allowing the above testing to be performed as desired.